Clothesline Chronicles: beware of the caterpillar! While we were playing in our backyard yesterday Miss O came across a strange caterpillar. Thanks to reading many bug books, she knew that if it looked too weird and dangerous for a bird to eat then it's best not to touch it. Boy was she right! This, my friends, is a Saddleback Slug Caterpillar. Bizarre is the best description. 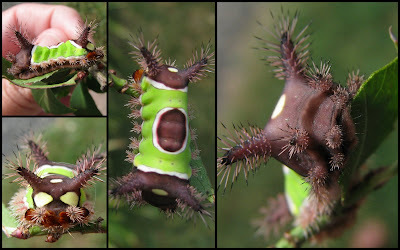 A tiny little guy, only about an inch long, but with some serious spikes and a crazy markings. Also, instead of 16 legs like a regular caterpillar this creature had the under body like a slug...although his sides are lined with sections of spikes. After reading up on this here Saddleback we discovered that touching it would result in many spikes coming out into our skin and stinging worse than a bee...with the pain lasting for several days also accompanied by nausea. Yikes! Plus, anyone with sensitive skin would have a more severe reaction. Double yikes! I thank God that neither of my girls nor Tim and I touched this caterpillar. In all of my years I have never seen one of these, but when I was telling a friend about it she had seen one as well. They are active during the day and can be seen as late as November, so like I said, beware of the caterpillar! Then in the early evening as I was taking my laundry off of the clothesline I saw this super fast crawling, feathery, tiger-striped caterpillar trucking across my driveway. This was the only descent shot I could get because he just wasn't slowing down for anything. After doing a little more research I found out that it was a Milkweed Tussock Moth Caterpillar. Although bright and dangerous looking, he was safe to touch, although the girls refrained as a precaution. The bright fluffy coat he is sporting was just a warning for the birds. Evidently if a bird eats a caterpillar that's been feasting on milkweed it will die of a little birdie heart attack if it doesn't quickly regurgitate the milkweed stuffed meal. Oh my gosh - those look like they belong in an Indian Jones movie! We found one random catipillar last year that was HUGE and he was an orangish/red spiked fella - both my boys were freaked out - didn't want to go near the thing (thank goodenss). Even hubby doned the gloves and an huge stick to move the thing off our back porch and 'help' him over the fence - YUCK!